Spain: Day 52 of 985 of the Spanish Civil War. Spain: Day 417 of 985 of the Spanish Civil War. CBI - China: Day 62 of 2,987 of the 2nd Sino-Japanese War. Day 25 of 106 of the 2nd Battle of Shanghai. Day 6 of 70 of the Battle of Taiyuan. Spain: Day 782 of 985 of the Spanish Civil War. CBI - China: Day 427 of 2,987 of the 2nd Sino-Japanese War. Day 88 of 139 of the Battle of Wuhan. UK: A radar fault triggers a false alarm of invading enemy aircraft and leads to a friendly fire incident over England, resulting in the first death of a British fighter pilot in the war. South Africa: General Smuts wins cabinet battle in South Africa and declares war on Germany. Poland: Day 6 of 36 of Germany's Invasion of Poland. German troops advancing through Poland occupy the former German industrial area of Upper Silesia. CBI - China: Day 792 of 2,987 of the 2nd Sino-Japanese War. CBI - Mongolia: Day 119 of 129 of the Battle of Khalkhin Gol. ETO - UK: Day 1 of 258 of the Blitz. The official start of the Blitz is initiated by the Germans in the third phase of their air offensive against Britain. The Luftwaffe intentionally bombs London and will do so a total of 71 times during the war. 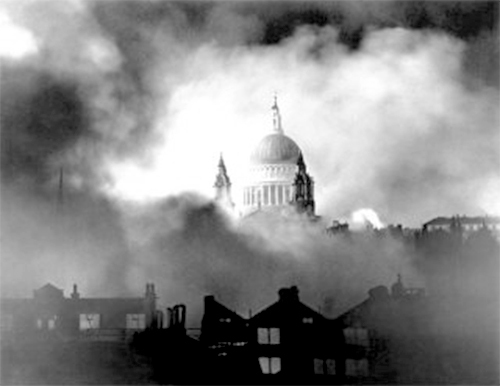 06 Sep 1940: The Blitz officially begins. The bombing did not achieve its intended goals of demoralizing the British into surrender or significantly damaging their war economy. In fact, the eight months of bombing never seriously hampered British production and their war industries continued to operate and expand. In comparison to the Allied bombing campaign against Germany, casualties due to the Blitz were relatively low. The bombing of Hamburg alone inflicted some 42,000 civilian casualties. By May 1941, the threat of an invasion of Britain had passed, and Hitler's attention was focused on Operation BARBAROSSA in the East. ETO - UK: Day 59 of 114 of the Battle of Britain. Atlantic: British naval blockade lifted on all French colonies supporting General de Gaulle. Romania: King Carol of Romania abdicates the throne to his son, Michael and appoints Marshal Antonescu as head of state. East Africa: Day 89 of 537 of Italy's East African campaign in the lands south of Egypt. CBI - China: Day 1,158 of 2,987 of the 2nd Sino-Japanese War. Day 297 of 381 of the Battle of South Guangxi. Day 18 of 42 of the Hundred Regiments Offensive. Russian Front - Finland: Day 77 of 164 of the Battle of Hanko. The Soviets will be forced off their leased naval base. Russian Front - Finland: Day 3 of 28 of Finland's reconquest of East Karelia in southern Finland. The Soviets continue withdrawing from the Karelian Isthmus back to Leningrad. Russian Front - Finland: Day 70 of 142 of Operation SILVER FOX, a joint German-Finnish campaign to capture the Russian port of Murmansk in the Arctic. Russian Front - Finland: Day 68 of 140 of Operation ARCTIC FOX, a joint German-Finnish campaign against Soviet Northern Front defenses at Salla, Finland. Russian Front: Day 77 of 167 of Germany's Operation BARBAROSSA, the overall invasion of the USSR. Hitler orders the capture of Moscow after the operations in Ukraine has been completed. Russian Front - Center: Day 21 of 23 of the Battle of Dukhovshina, Russia. Russian Front - Center: Day 8 of 10 of the Battle of Yelnia, Russia. Russian Front - Center: Day 8 of 14 of the Battle of Roslavl-Novozybkov, Russia. Russian Front - South: Day 30 of 70 of the Siege of Odessa, Ukraine. Russian Front - South: Day 15 of 35 of the 1st Battle of Kiev, Ukraine. MTO - Libya: Day 150 of 256 of the Siege of Tobruk. Middle East: Day 13 of 24 of the Anglo-Soviet invasion of Iran. East Africa: Day 454 of 537 of Italy's East African campaign in the lands south of Egypt. CBI - China: Day 1,523 of 2,987 of the 2nd Sino-Japanese War. Day 1 of 33 of the 2nd Battle of Changsha. PTO - Japan: The Japanese decide to be fully prepared for war by the end of October. ETO: US 8th Air Force warplanes attack various airfields in northwestern France. Russian Front - North: Day 364 of 872 of the Siege of Leningrad. Russian Front - North: Day 125 of 658 of the Siege of the Kholm Pocket, USSR lays siege to the Kholm Pocket but the Germans hold out for a about a year and a half. Russian Front - Center: Day 39 of 64 of the 1st Battle of Rzhev-Sychevka, Russia. Though it will end in a stalemate, it will keep German troops from going to Stalingrad. Russian Front - South: Day 71 of 150 of Germany's CASE BLUE, the failed offensive to take the Caucasus oil fields. Russian Front - South: Day 15 of 165 of the Battle of Stalingrad, the bloodiest battle in human history. The 4th Gebirgsjager division of the 17th Army captures the Black Sea naval base of Novorossiysk, while six Axis divisions cross the Straits of Kerch to Taman. Heavy house-to-house fighting continues in the center of Stalingrad. MTO - Egypt: Rommel is back to the positions held on the 31st August, having lost 51 tanks (out of 515), 70 guns, 400 trucks and 2,865 men. The British 8th Army losses were 1,640 men and 68 tanks. East Africa: Day 125 of 186 of the Battle of Madagascar. CBI - China: Day 1,888 of 2,987 of the 2nd Sino-Japanese War. Day 115 of 124 of Japan's Zhejiang-Jiangxi Campaign, launched to punish anyone suspected of aiding the Doolittle raiders in China. Roughly 250,000 Chinese will be killed. PTO - Alaska: Day 92 of 435 of the Battle of Kiska, Aleutian Islands. The US and Canada will defeat the Japanese invaders. PTO - Malaya: Day 200 of 357 of the Battle of Timor Island, a long guerrilla war ending in Japanese victory. PTO - New Guinea: Day 48 of 119 of the Battle of the Kokoda Track. The Japanese continue driving over the Owen Stanley Range toward Port Moresby. This will become an Allied victory. PTO - New Guinea: Day 13 of 14 of the Battle of Milne Bay. The Australian troops continue beating back the Japanese troops. The US and Australian troops will win this battle. PTO - Solomon Islands: Day 31 of 187 of the Battle of Guadalcanal. ETO: US 8th Air Force: B-17s bomb at Stuttgart, Germany. B-26s attack targets at Ghent, Belgium and at Amiens, Serqueux and Rouen France. Russian Front - North: Day 729 of 872 of the Siege of Leningrad. Russian Front - North: Day 490 of 658 of the Siege of the Kholm Pocket, USSR lays siege to the Kholm Pocket but the Germans hold out for a about a year and a half. Russian Front - Center: Day 31 of 57 of the 2nd Battle of Smolensk, Russia. Becomes a Soviet victory as the Axis are pushed completely away from the Moscow region. Soviets capture Yelnia and Dorogobuzh thus splitting German Army Group Center away from Army Group South. Russian Front - Center: Day 21 of 48 of the Battle of Bryansk, Russia. Soviet victory as the Germans began retreating. Russian Front - South: Day 14 of 122 of the Battle of the Lower Dnieper River, USSR. MTO - Italy: US 12th Air Force bombs five Italian targets in Italy and at Pabillonis, Sardinia. US and RAF fly fighter patrols hitting targets of opportunity on the Italian toe. CBI - China: Day 2,253 of 2,987 of the 2nd Sino-Japanese War. PTO - New Guinea: Day 138 of 148 of the 2nd Battle of Lae-Salamaua. Will become an Allied victory. PTO - Solomon Islands: Day 23 of 56 of the Battle of Vella Lavella. The Allies will win this one. ETO - UK: Day 86 of 86 of the V-1 "Buzz Bomb" offensive on Britain. The V-1 rocket bombardment has seen over 8,000 flying-bombs launched, with approximately 2,300 reaching London. ETO - France: Day 37 of 284 of the Battle of Brittany. ETO - France: Day 23 of 32 of Operation DRAGOON, the Allied invasion of southern France. US and French troops continue racing up the Rhone Valley. ETO - Belgium: Day 5 of 62 of the liberation of Belgium. The Canadians surround Calais, trapping the German garrison. Liege falls to British troops, while the US 1st Army pushes east through Belgium, crossing Meuse. Ghent and Courtrai are also liberated. ETO: US 8th Air Force: P-38s and P-47s strafe targets in Netherlands and Germany. B-24s fly gas truckin' mission into France to supply Patton's Army. Russian Front - North: Day 28 of 28 of the Battle of Tartu in southeastern Estonia. The Soviets defeat the Germans and capture Tartu. Russian Front - South: The Russians occupy Turnu-Severin on the Danube in Romania and advance to the Yugoslavian border. They also reach the eastern Carpathians. MTO: US 15th Air Force: B-24s attacked targets in Romania, Yugoslavia and Hungary. Two bombers snuck into Bucharest, Romania and evacuated interned airmen. MTO - Italy: US 12th Air Force: Before daybreak, A-20s attack targets of opportunity in the Savona and Milan areas. MTO - France: US 12th Air Force: Fighters fly armed reconnaissance over the Belfort, Dijon, and Colmar areas. They destroyed several locomotives and numerous transport vehicles and a tank. CBI - Burma: Day 159 of 302 of the Chinese Salween Offensive. CBI - China: Day 2,619 of 2,987 of the 2nd Sino-Japanese War. Day 143 of 259 of Japan's Operation ICHI-GO. PTO - New Guinea: Day 267 of 597 of the Battle of New Britain. PTO - New Guinea: Day 138 of 481 of the Battle of Western New Guinea. CBI - China: Day 2,984 of 2,987 of the 2nd Sino-Japanese War. PTO: Japanese forces in Southwest Pacific surrender aboard HMS GLORY.